More than anything else, Assassins is about a battle for control of the storytelling. Every moment in the show is about that. And isn't that a metaphor for all our lives? On one team, Balladeer, as a stand-in for American pop culture and entertainment throughout our history, simplifying and misrepresenting the truth. His music is pure Americana, but his lyrics are shallow, simple-minded. Storytelling is central to any culture, but the Balladeer's songs show us how American culture distorts the complexity and nuance of the truth. On the other team, the Assassins, all presented without judgment, allowed to tell their own stories and make their own cases, in their own voices. And with each assassin's song, the musical form matches both the period and the personality of the assassin. 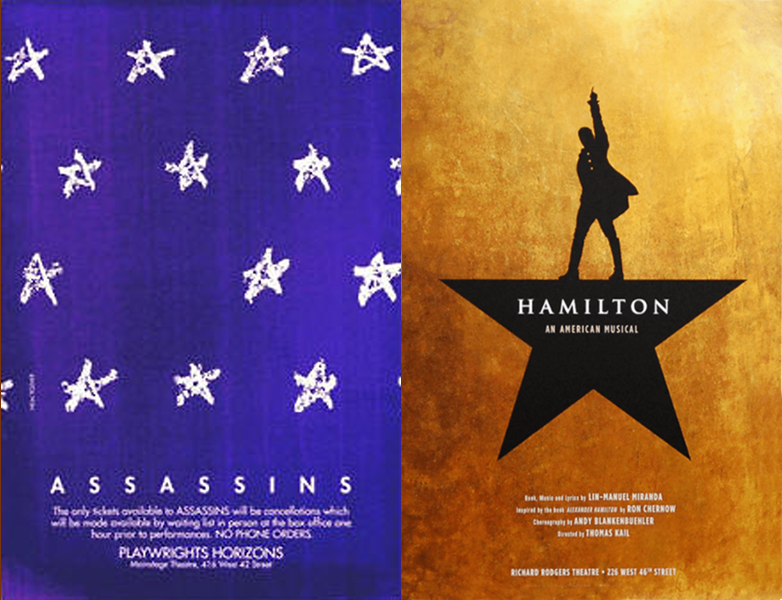 With two exceptions, the entire score is written in styles appropriate to each assassin’s time, and all in traditional American song forms. For Sondheim, those forms include not only folk songs and cakewalks, but also John Philip Sousa marches, barbershop quartets, show tunes, even 1970s pop ballads. The exception to this is “Another National Anthem,” the one song in which the overall dramatic situation of the show actually changes. Appropriately, this is the one song that is not a period piece and not a traditional American song form; it is pure Sondheim, full of rich dissonance and interesting melody. 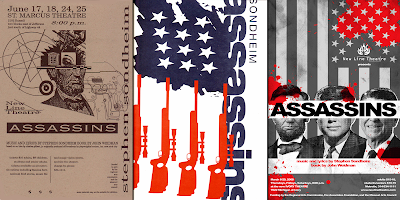 It is in “Another National Anthem” that the assassins first reject the Balladeer’s American Dream and realize that there is safety – and power – in numbers. The other exception is "Something Just Broke," which wasn't in the original version, doesn't follow the rules of the rest of the show, and interrupts the amazing original transition from Oswald's shot through to the finale. Can you tell I don't like it? But it's “Another National Anthem” that shares the now famous theme with Hamilton, "Who lives, who dies, who tells your story." The assassins onstage literally solicit the audience to become assassins. Led by Byck, they tell us that they’ve tried the traditional American Dream, the one proffered by the Balladeer, and it doesn’t work. They’ve found a better American Dream, another national anthem. They sell it to us, asking us to pass on their message, singing over and over, “Spread the word.” They know that we (the audience) all have unrealized dreams just like they do; they know that we all want the same thing, and they know how to get it now. In a way, it becomes the most optimistic song in the show, precisely because the assassins have found the answer. But it's also infused with great anger, carried to enough of an extreme to justify their extreme acts. Byck compares the fairy tale of the American Dream to Santa Claus, and we realize how meaningless the Balladeer’s empty optimism is to them. For these assassins, the American Dream really is as silly as Santa Claus and the Easter Bunny. As the Balladeer spouts his homespun clichés about a country built on dreams, we see how little this means to this group of people consumed by despair, grief, rage, and feelings of abandonment. 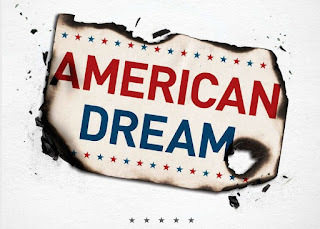 For most of us in the audience, it will be the first time we’ve looked at the American Dream in such a harsh light, and realized how irritating it must be to the disenfranchised members of our society who can never have what we tell them they should have. Are we, as an audience, complicit in that? These assassins are newly empowered. They have taken over the Balladeer’s role – that of passing on stories – and they literally chase the Balladeer off the stage in the middle of the song, silencing the only voice in the show still in favor of "old-fashioned American values." The Assassins become a new voice of authority and they take control of the show as they realize that they have even greater power as a group than as individuals. They see the Balladeer’s and America’s Great Lie – that the mailman, the delivery boy, even the usherette can have the American Dream if only they try hard enough. These assassins have listened to that lie for too long, and have seen it for what it is – a con.. The ballpark is mainstream society; the game is the American Dream. Though the assassins can’t get into the ballpark, they can certainly interrupt the game. With their newfound confidence, they pick up on one of the Balladeer’s themes – that you have to keep on trying. Maybe they can’t have the prize they were promised, but there are other prizes to be had. For those who wanted fame, they got it. For those who wanted to effect political change, they at least called attention to their cause. For those who wanted to “connect,” they have done just that. They have become a new voice of America: “We’re the other national anthem.” They realize that they really can effect change. They sing, “There’s another national anthem and I think it just began...” Their anthem is playing now. It’s their turn. They have changed who tells their story. The genius of Stephen Sondheim and John Weidman. 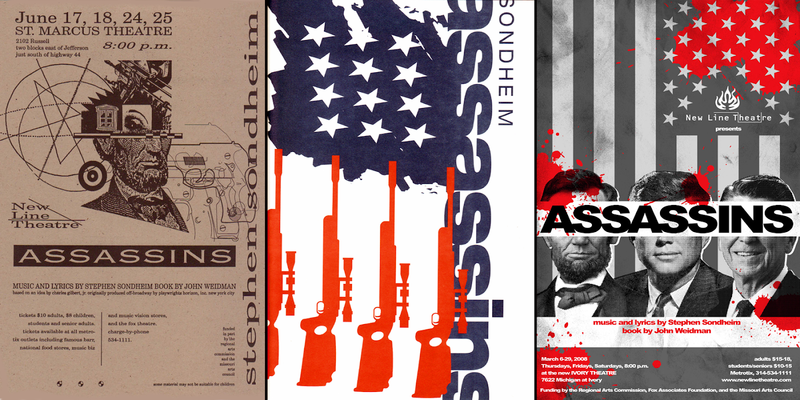 New Line has produced Assassins three times, in 1994, 1998, and 2008. It's a genuine masterpiece, though I didn't love the changes the revival made, like adding a devil figure, which totally lets the assassins off the hook. And yes, I wish we could leave out "Something Just Broke." But it's truly one of the greatest works of our art form in the last fifty years. 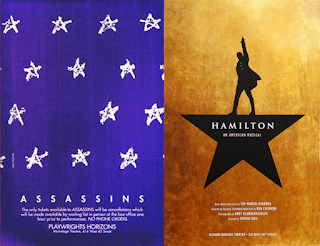 As much as we know Lin-Manuel Miranda loves Sondheim, it's not a stretch to think that the themes of Assassins were in the back of his head when he tackled Hamilton. The two shows are companion pieces in so many ways, both about storytelling, about point of view, moral gray area, both about America itself. See why I love musical theatre?